Dan Fenaughty, Lea McKenna-Garcia, Christopher Daftsios, and Chris Berte in Two Of Us. Photo by Hunter Canning. BOTTOM LINE: Two of Us pairs one of the country’s most famous assassinations with one of its most beloved books: who knew Holden Caulfield pulled the trigger on John Lennon? Mark and Gloria Chapman, our “Him” (Chris Bert) and “Her” (Vivian Chiu) of the story, enter The Two of Us as faces whom the audience likely knows too well. It is nearly impossible for anyone who has ever listened to The Beatles to not know that John Lennon was assassinated by Chapman in December 1980. It's a story that many witnessed first hand; doubtless some in the audience will remember every detail of that very day. Basing a ninety-minute play upon an event that so radically shook the world is already a challenge; who’s to say that this interpretation is correct? Despite this obstacle, writer Ross Howard—whose works are currently being celebrated as part of a “Ross Howard Festival” with the New Light Theater Project—crafts this drama into a dissection of the relationships and mental instabilities that lead Chapman to pulling the trigger that night. Gloria and Mark undoubtedly have their issues in their Honolulu home following Mark’s loss of yet another job. When the two need help most, figments of their respective imaginations join them onstage. For Mark, he is accompanied by Robert (Christopher Daftsios), a British businessman obsessed with settling debts, dressed in a jazzy suit and bowler à la London’s Kray brothers of the 1960s. Robert tends to stir up wild ideas within Mark, treating the thought of assassinating John Lennon as Mark’s duty. Gloria’s visions come to her in the form of the biblical Sarah, wife of Abraham. As Gloria turns toward the bible to save her marriage and her husband’s sanity, Mark turns toward his own books: The Catcher in the Rye and a photo book of John Lennon.The gap between husband and wife grows wider as Gloria preaches submission to kindness and Mark becomes a rightful Holden Caulfield, rejecting “phonies” at any chance possible. As a Salinger fan myself, this presence really brought to life a story I thought I already knew. Although the dramaturgical work (editor note: by Theasy's Founding Editor Molly Marinik) is fantastic, it is interesting to notice how many thematic, most likely fictional parallels run between these historical accounts of Mark Chapman and J.D. Salinger’s story. Mark feels like a failure surrounded by a world of liars, and wants to kill John Lennon, the celebrity who never practiced what he preached. Mark wants his voice heard in the same way that Holden fantasizes about committing a noble act, even if it means he’ll die. When this becomes apparent, escapism within New York shines through. As his wife even points out, the book is entirely to blame for why Mark is suddenly so fixated on stopping the “phonies” of the world. In more minute moments Mark, like Holden, is curious about where the birds on the pond in Central Park go for the winter, and even has the same exact exchange with a prostitute in a freshly cleaned green dress. 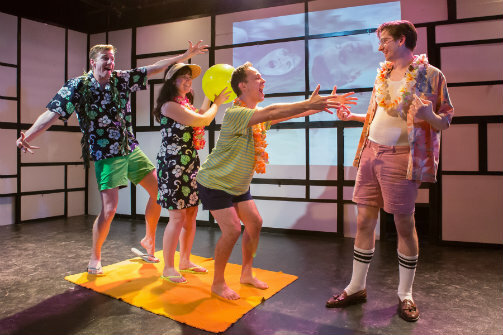 This, juxtaposed with a set designed to imitate a monochrome version of Piet Mondrian’s “Composition II in Red, Blue, and Yellow” and a series of That 70’s Show-esque interludes in which we see the cast transitionally dancing in front of a tie dye background, creates a confusing theatrical environment. On one hand, it seems as though perhaps these transitions and the set exist to show just how out of place Mark Chapman is—his social skills are a bit lacking, especially sexually, and the musical transitions allow the audience to see his stiff attempts at dancing. But the transitions tend to cut off all of the tension built up in the previous scene. Although perhaps it’s a good thing that a piece focusing on a celebrity assassination doesn’t take itself too seriously and allows a wide margin for comic relief, no matter how whimsical. Although the story of Mark and Gloria Chapman is exceptionally volatile, the overall message comes across: everyone just wants to be a catcher in the rye, saving someone from falling off the cliff, and sometimes we are the ones who need to be scooped up and brought back to earth. Even if this extended metaphor doesn’t work for you, you may still leave wanting to find your high school copy of The Catcher in the Rye and give it another read—I know I did. Two of Us is by Ross Howard. Directed by Sarah Norris. Scenic design by Brian Dudkiewicz. Costume design by Genevieve V. Beller. Lighting design by Michael O’Connor. Sound design by Andy Evan Cohen. Projection design by Zach Griffin. Choreography by Arthur L. Ross. Associate scenic design and prop design by Samantha Schaffer. Technical direction by Paul Passaro. Production management by Joshua Shain. Production stage management by Erikka Anderson. Assistant stage management by Lindsey Hurley. Master electrician David Shocket. Dramaturgy by Molly Marinik. Casting by Stephanie Klapper. Casting assistance by Alexa Magnotto and Ari Rudess. Press representation by Ron Lasko (SpinCycle). Logo design by Cody Butcher. Produced by Michael Aguirre and the New Light Theater Project. The cast is Chris Bert, Vivian Chiu, Christopher Daftsios, Dan Fenaughty, Lea McKenna-Garcia, and Janae Mitchell.